HP's Photosmart Premium C309g-m offers many of the features you would expect from an inkjet multifunction in this price range, like Wi-Fi, advanced photo printing functions and even a touch screen. However, it lacks CD/DVD printing and we experienced issues when connecting to a wireless network. The HP Photosmart Premium C309g-m connects over USB, Ethernet, Bluetooth and Wi-Fi (when using Wi-Fi you can only join existing networks, not create ad hoc ones). Once configured, we found the Photosmart Premium C309g-m would periodically disconnect from our Wi-Fi network after a period of inactivity, and could only be used wirelessly after first waking the printer. We aren't the only ones to experience this issue, either. The multifunction's memory card reader supports MemoryStick, SD and xD cards and its USB port can read from both flash drives and PictBridge-compatible cameras and mobile phones. You can scan to, and print photos from, both cards and flash drives, but the printer won't recognise documents or PDFs. There is a separate photo tray, so you can keep A4 and 4x6in media in the HP Photosmart Premium C309g-m at the same time, and the automatic duplexer lets you print double-sided documents. However, unlike the Photosmart Premium C309a there is no direct CD/DVD printing or automatic document feeder. The HP Photosmart Premium C309g-m features a 3.45in touch screen based on the same technology found in HP's Touchsmart PCs. The panel is bright, colourful and very responsive. Like the Lexmark Prestige Pro805 the panel's quick access buttons only light up when a particular function is useable. 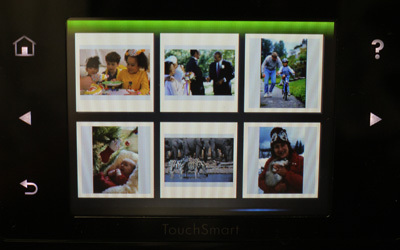 You can use the Touchsmart panel to access Snapfish by HP, an online photo storage and printing service. From the Photosmart Premium C309g-m inkjet multifunction you can view and edit your Snapfish photos and upload more from memory cards and flash drives. You can also print photos in a variety of sizes including wallet, postcard and even panoramas. Loading album thumbnails for the first time slows down the printer, but they subsequently load much faster. HP's Photosmart Premium C309g-m managed reasonable print speeds in all of our tests and produced readable output even at draft quality. Thanks to its print resolution of 9600x2400dpi, this multifunction printer produces very accurate text documents, though at 7pt the characters lose clarity slightly. Graphics combine with text well and don't look inky. Photos are vibrant and detailed, with black levels that made our monochrome test photo look great. This multifunction printer definitely excels at photo printing, though it is capable of producing high quality documents and graphics on matte media as well. Unfortunately, this print quality comes at price — 25.3c per A4 page, to be precise. Scans can be initiated from the control panel to memory cards, flash drives and computers, though we were unable to initiate a scan to a computer connected via USB or Wi-Fi. The HP Photosmart Premium C309g-m has an optical scan resolution of 4800dpi but as there is no way to change scan settings directly from the control panel, so you are stuck with the standard — and rather low quality — settings when using the printer directly. Those looking to access online photos and produce high-quality printouts will enjoy using the HP Photosmart Premium C309g-m, particularly thanks to the responsive touch screen. However, it isn't as versatile as Canon's PIXMA MP640 and difficulties with wireless networking can be frustrating.